In all the Week 1 makeovers, Green Arrow gets what seem to be among the most significant adjustments. He’s still, on the surface, an acrobatic bow expert who dresses in green and shoots trick arrows, but a lot of other stuff has changed for Oliver Queen. For starters, his look has been completely updated. Gone is the Errol Flynn style Robin Hood hat of the Golden Age, gone is the distinctive van dyke facial hair that has long served the character, and gone too is the hooded “modern Robin Hood” look of the Longbow Hunters series. This Green Arrow looks quite a bit more like the Connor Hawke version of the character from about 10 years ago, which is to say his costume looks a bit more like the sort of body armor a modern superhero would wear, and less like a suit of tights or a Halloween costume. He’s also got a cool pair of goggles that he can change for an infrared view, and probably a lot of other things as well. We don’t see a ton of trick arrows in this issue (certainly not the venerable “boxing glove arrow”), but we do get an awful lot of other technological gadgets like throwing disks (with various powers), an extending bow that starts about a foot long but grows into a compound bow, and a full-on Oracle-style computer genius back at the home office to talk him through his missions and provide important bits of exposition. All of this supports a much greater involvement of Oliver Queen’s mega-corporation, Queen Industries, which writer J.T. Krul casts in the mold of a modern Apple Computer. The folk of the DC Universe run around with Q-Phones and Q-Pads, suggesting that Queen’s commercial products are at the cutting edge of innovation. A nice panel on page one shows that their chief technological competitors are Waynetech (Batman), Lexcorp (Lex Luthor), and Holt Industries (Mr. Terrific), which is a fitting way to root the series in the DC Universe at large. Character-wise, Green Arrow comes off as a bit younger than his previous incarnation. He’s much more involved in an offshoot technology company called Q-Core, which employs his computer helper Naomi and his peace-loving weapons expert Jax. I think both of these are new characters with the reboot. In any event they give Green Arrow folks to talk to during action scenes and have the workings of a nice cast of background players, even if both of them are fairly stock comic book characters. Both Queen Industries and Q-Core are based in Seattle (GA’s sometimes home of Star City may be a thing of the past), which is pretty laughable speaking as a current resident of the city. Jurgens’s skylines bear almost no resemblance to the actual city, with the famous Space Needle jumping around as needed to show “this is Seattle.” I didn’t recognize any other landmarks, which strikes me as lazy. As the series goes on, I recommend Jurgens visits the city, or at least gets a nice book with some of the other landmarks. Speaking of Dan Jurgens, his simple illustration style makes this feel a bit like a book out of the 1990s. The storytelling is competently done, and the panels flow smoothly from one to another, but there’s very little going on artistically to set this book apart from any others. That’s not quite true. Green Arrow is set apart from the other books visually because it looks like it could have come out 20 years ago. I’m not sure that’s a good thing. It didn’t bother me too much, but this isn’t going to be the eye-catcher that will launch Green Arrow to the top (or even the middle) of the sales charts. Almost nothing about this book seems fresh, but then I am getting ahead of myself. Hookay. I guess that’s better than constant moralizing about corporate greed and the environment and other “left wing” issues, but it doesn’t come across as particularly authentic. The fight moves to a party boat, on which Green Arrow takes out the bad guys one by one with various gadgets and the assistance of his off-site team. There’s a really cool part where he shoots an arrow into the boat’s controls, and antennae on the arrow allow his hacker Naomi to drive it around remotely. Otherwise it’s pretty standard Green Arrow fare. Then it’s back to Q-Core for two pages of exposition, including a hint that Ollie once stood by when he could have helped and a lot of people died because of it. I’m guessing that’s what’s behind his motivation to become Green Arrow, and I’m certain we’ll be coming back to it in future issues. Then it’s back to our no-namer villains in prison, who are sitting around bitching about Green Arrow when the wall collapses to reveal their rescuers, a group of eight generic no-namer villains who look like they could have stepped out of a late-80s issue of Alpha Flight. Krul and Jurgens do an adequate job of reinventing the character, and the issue is certainly accessible to new readers. I’m just not sure that what they have created is all that interesting. 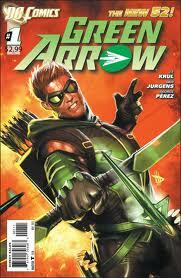 Consequently, Green Arrow is the first New 52 comic that I’m not sure I’ll even bother to pick up next month. It’s not horrible, or anything, but it just doesn’t come across as all that special. If you desire to improve your familiarity just keep visiting this web page and be updated with the most up-to-date information posted here. You’re making it entertaining and you continue to take care of to stay it smart. I can not wait to read far more from you. That is actually a terrific site.